Setting Digital Performance Goals for my Office Products Business! Today we're placing ourselves back in the shoes of our office products reseller. Previously we completed a self-assessment of the digital status of our Amarillo-based office products business and, in so doing, set the baseline to establish goals for a two-year improvement plan for achieving a digital business transformation. Today, we're going to build that plan and set those goals. This exercise will set the foundation for measuring the return on investment (ROI) on the funding required to execute. We're going to be looking at a two-year plan and we're dividing its development into two 12-month phases. "We decided to make a couple of changes to the baseline data we'd originally prepared. After thinking about what was needed, I thought it made more sense to set our baseline off a 12-month history as opposed to six months. Apart from that, the baseline is unchanged from the original self-assessment checklist. The 12 and 24-month goal is where we want to be at the end of the two respective time periods. I'm about to explain the logic we've used for building out the plan and some of the concerns we have for achieving the goals we're setting. Before I start, just a reminder in case you think we have the "cart before the horse" that we're still at the conceptual stage with this initiative. I don't have an execution plan and, besides the cost worries, I'm concerned how we're going to pull all this together without some kind of integrated information technology platform. However, we'll come back and address these concerns later, once we feel like we have a viable plan, with a satisfactory ROI, and that we can afford to finance. Firstly, on the website itself. We felt, with some help, we could get this to grade out at 90 by the end of 12-months and 95 by the end of the second year. You can see the elements we expect to improve in the table. Feel pretty confident we can get this done. We're going to get our e-commerce capability set up again. This time, it's going to be done right and we're going to embed it directly into our site. No more misguided efforts trying to run two sites when one is all we need and could ever hope to be successful with. Of all the things we need to do, the e-commerce capability is one of the highest priorities. I just don't see how we can move forward without showing customers and prospects what we offer, what it costs, and providing them the capability to transact online when they choose to do so. The local listing directories. We know enough now that, any chance we have of appearing high in search ranking, is only going to happen with local searches. We know this is going to be achieved with (what we found out to be called) long tail keywords - more like phrases than single words. But, if we're not listed accurately on all these directories then we're not going to show up as well as we could. 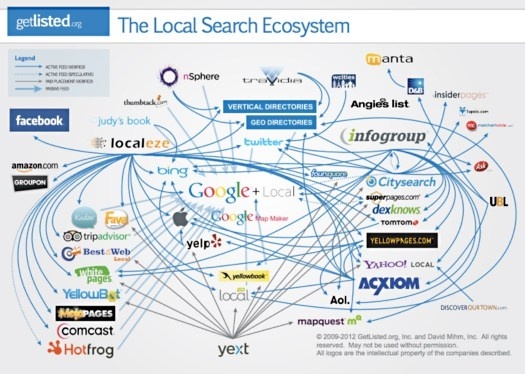 I found this great infographic showing the spiders web of local directories which, until now, had no idea existed. I'm told we could fix our listings one-by-one but, I'm also told this will take a lot of manual work that we don't really have time for. Then I found out there are services that push out a listing the way we want it and is electronically transmitted to each of the directories. They charge a monthly fee to keep it accurately maintained. A quick search and this service seems expensive - somewhere in the region of $60 a month, which I'm not ready to spend. We'll be taking a further look around to see if there are other less expensive options. Finally, on the website side, we're registering with Google Search Console and making sure our Google analytics are all connected properly. For the keywords, although I don't really know what I'm talking about, I think a bit of grunt work to do the research and we can have ten keywords ranked in the top ten by the end of the first year and 100 by the end of the second year. Again, we may have to pay for some help here to figure out what the most effective long-tail keywords are for our business in our local market. 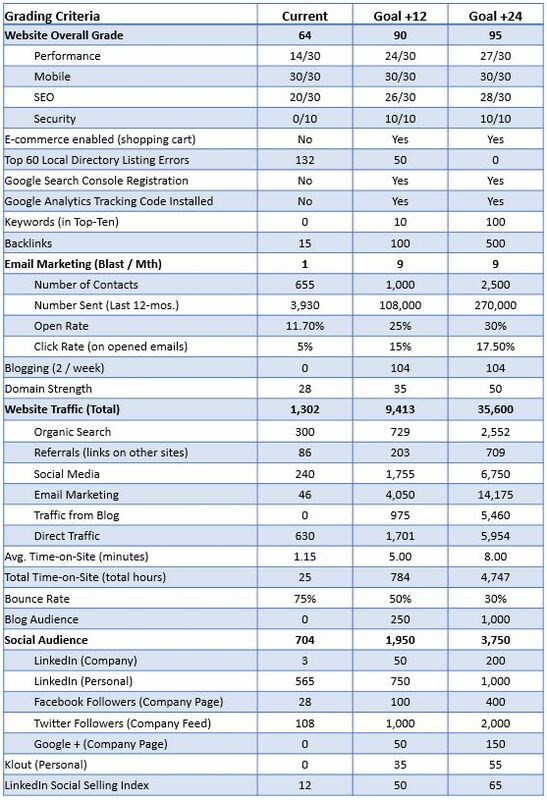 Our backlinks target - I know this is important and we're setting an aggressive goal to get 500 by the end of the second year. I'll be completely honest, I've no idea how we're going to achieve this. I know it's going to be contingent on lots of high-quality content that other sites like, and voluntarily create links to. You'll see in a moment that we're setting some aggressive email and blogging content goals so, for now, I'm taking a leap of faith that, if we achieve these content goals, then we'll eventually get the backlinks. Firstly, we're going to email our contacts twice a week. On average that's nine times a month. Secondly, we're going to aggressively build our contact database. We're going to focus on our local market and reckon we can get to 2,500 contacts by the end of our two-year plan. We're very motivated because of what the numbers in the assessment form show us. An audience of 2,500 receiving two emails a week for 52 weeks equals 270,000 emails a year. Right now, we're lucky if we send out 4,000 a year. From what I can see, it's only going to cost a few more dollars a month to send out the extra emails. After doing some research, I think we can get a 30% open rate and 17% click rate, which would result in over 14,000 visits to our website. If we can achieve these goals then, this initiative will, by far, be our largest source of traffic. We know this has to be done but, we can't do it ourselves and we don't know anyone with the ability to do it for us so, I'm in a bit of a quandary how to move forward. I'm sure there are agency's offering these services but, they're going to be expensive and, if they don't know our business or our industry, how can they write about it? I can't ignore the blog but I don't have an answer to this problem for now. I know the blog is important because this will be where we prove we know what we're talking about. If we can't demonstrate this, then all those buyer searches are not going to pay us any attention. But, if we can, then we'll build an audience that'll start to engage with us. From what I can understand right now, it looks like the best practice will be to consistently blog twice a week while recognizing it will still take the time to build a sizable audience. My target is to get 1,000 blog subscribers by the end of the second year. Blogging will keep our content fresh and generate new pages at our site. I'm told this is what Google likes to see and what will help us (not only with high-quality backlinks) but also with building our domain strength. The higher our domain strength the higher we'll be ranked in searches! Again, I don't yet know how we're going to do it but, we're going to focus on building up a local audience on Facebook, Google+, Twitter and LinkedIn. Our target is to develop a social audience of 3,750 by the end of year-2. If we can pull all this off then, we think we can get to 36,000 visits in the second year of the plan. This is a big increase from where we're at today but it's still only an average of 3,000 visits per month. I think it's a realistic goal if we can do all the other stuff we've targeted. In doing some research, what I can determine is, if our content is relevant and interesting, it should translate into fewer bounces and more time spent on our site. Our goal is to get the average time-on-site up to eight minutes, partly by reducing the bounce (from 75% to 30%), and partly from the improved content. If we can achieve these goals, then we would have over 4,700 hours of total time on site in the second year - up from maybe 25 hours in the last 12 months. We're not going to directly focus on building up these scores. Instead, what I'm told, is they will organically increase if we're doing all the other things right. We'll have to publish material our audience likes, shares, and comments on as, apparently, this is what these Indexes look for with their scoring algorithms. I'm hoping we'll see quick improvements which will help keep us motivated and provide validation what we're doing is working. Our target is to get our Klout to 55 and our SSI to 65 by the end of the second year. If we don't, then I suspect it will mean we'll be missing our traffic targets because the content somehow missed the mark and our audience didn't engage. I'm under no illusions just how difficult pulling this off is going to be and expect there will be a lot of fine-tuning as we learn what works best. OK, so now we've set our goals and the bottom line is, I really want the 36,000 visits to our website that we've targeted in the second year of the plan. Going through this process has made me realize how much work is involved and, that there are no obvious shortcuts to get us to where we want to be. But, it's so important because I think achieving these goals is the key for us to turn around the recent revenue trend and customer loss we've experienced. My next step is to figure out how much it's going to cost and who's going to do the work. As I said before, I'm really worried how expensive it's going to be and who's going to get us set off down the right path. I, for sure, don't know what to do on a lot of the individual details and we don't have anyone on staff who does either. Worse still, I don't know where to start with hiring someone that has all the skills we need. Unfortunately, I could hire someone who says they have them, presents well at the interview but, later turns out not to be able to do what they claimed. If I knew more than I do, I could reduce the hiring risk but, I don't, and I can't change that in the short term! Despite not having a good answer for this problem right now, I'm going to go ahead and figure out the cost to execute the plan so I can calculate what the return is going to be. I've got a pretty good idea how we can project new business based on website visits and I'm pretty confident I can figure out the approximate cost. Once these are done, I can calculate the ROI. As I've said, we really want to execute this plan! We think there's life left in the office products space, especially when leveraging aftermarket office supplies but, if we don't upgrade our marketing and our approach to the way business is now being conducted then, that decline in sales and loss of customers we've started to experience could quickly turn into a death spiral!" As I continue with our story of our Amarillo-based office products reseller, we can see there's now a plan with tangible goals. In the next blog, we'll see how much it's expected to cost, and what quantifiable sales goals are expected to result. As these steps are completed we'll see the Return on Investment (ROI) calculated and arrive at the decision point for moving forward or not. We think there's a positive future for office supplies dealerships with no reason why small business and sales channel development can't successfully go hand-in-hand. If you're interested in how we may be able to help you with your digital business transformation please click on the button below to choose a time slot that fits your calendar and ours to schedule your personal "no obligation" consultation. You may also be interested in our office products story in the Twitter Moment from the link below that talks to the $20 billion growth opportunity. Despite the mature market, it's still a big market and there's a significant office products growth opportunity for those that learn how to take advantage of it! Office Products Resellers and a $20 Billion Growth Opportunity!